A CLIMATE OF FEAR The Second World War ended in 1945 with the devastation of the Japanese cities of Hiroshima and Nagasaki, as the U.S. demonstrated its powerful nuclear bombs. The Soviet Union did not lag far behind, successfully testing its first nuclear weapon in 1949. As the arms race between the world’s two superpowers accelerated, the threat of a deadly global war became increasingly real, held back only by the threat of “mutually assured destruction” and, especially in the Western world, the rise of war-weary public opinion. 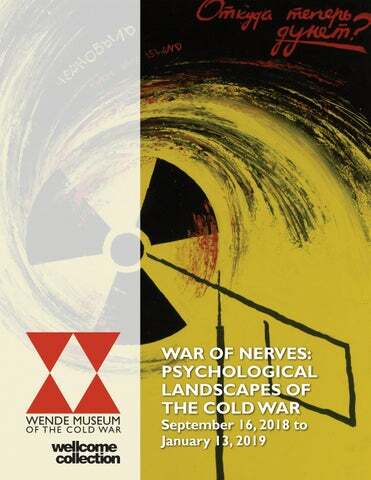 For some people, the fear of nuclear destruction was an unbearable source of mental stress. For others, more personal fears were symbolized by the threat of the atomic bomb. But preparation for the worst could also become part of social life. Civil defense activities, including medical preparations for the aftermath of an attack, paradoxically and somewhat perversely strengthened the bonds of civilian society. The image of the atomic mushroom cloud, first witnessed in Japan, became familiar through U.S. nuclear tests in the 1950s. A mixture of fear and elation about this powerful new phenomenon is expressed in the photo of Miss Atomic Bomb, the winner of a beauty pageant held in Las Vegas, near the site of the atomic tests. Civil defense encouraged civilian populations to anticipate the terror of a nuclear attack. Being prepared, and taking medical precautions for the aftermath, allowed for a sense of control over the uncontrollable. Selected items from three medical emergency boxes stored in the nuclear shelter underneath the Capitol building, Washington, DC. The boxes, marked with the Civil Defense logo, contained among other things aspirin, penicillin,Vaseline, laxatives, eye and nose drops, thermometers, surgical pads, and instructional booklets. They were rediscovered in 2011 in the attic of the Russell Office Senate Building. The nuclear shelter underneath The Greenbrier, a luxury resort in White Sulpher Springs, West Virginia was built for members of the United States Congress. This bunker was constructed from 1958 to 1962, and the location was kept a secret until 1992. The short-lived Protect and Survive Monthly encouraged individuals to think about, and prepare for, surviving a nuclear attack. With these photographs, Hauswald allows a peek into the countercultural side of public life in the In theimages 1980s,ofalternative During the Cold War, propaganda was employed by both sides to GDR. construct the enemylifestyles that reinforced existing such punk,and although by to the lack stereotypes. The cinema was particularly suited to the battle for as hearts minds.strongly Westerndiscouraged movies pointed the Socialist Unity Party, became an ever more of political and economic freedoms and human rights in the East; Soviet Bloc films pointed to greed, corruption, and visible of everyday life.both sides of the Iron Curtain. racism in the West. No less important was the crusade against thepart internal enemy on However, films also became a medium for protest against stereotypes, both in the East and the West. MIND CONTROL The Korean War (1950–53) gave birth to the new idea of “brainwashing”: the systematic control of others’ minds that could change worldviews and political allegiances. Both sides pursued the elusive science of mind control in largely secretive programs, while also accusing each other of employing underhanded methods in the laboratory and at large. Brainwashing, and associated conspiracy theories, became ubiquitous plot devices in popular culture. For the subjects of real-life brainwashing experiments, the effects could be traumatic and far-reaching. Two films, made for the Hidden Persuaders research project at Birkbeck College, University of London, explore the origin of the idea of brainwashing in the Korean War of 1950–53. Every Man Has His Breaking Point highlights Ronald Reagan’s role, first as actor and then as politician, in the framing of the American POW experience. David Hawkins: A Battle of the Mind looks at the story of an American soldier who chose to move to China at the end of the war. While journalist Edward Hunter popularized the idea of brainwashing, academics and psychologists like Robert Jay Lifton looked for its basis in political practices. Popular comics and films delighted in showing the machinations of mind-turning. Sarah Anne Johnson’s grandmother Velma Orlikow was an unwitting participant in CIA-funded brainwashing experiments by Dr. Ewen Cameron at McGill University in the mid-1950s. Johnson’s House on Fire series explores the long-term traumatic effects on Orlikow and her family, especially the struggle to cope with everyday life after returning to a domestic environment. Mind control need not be a literal process of coercion: widespread social and political conformity and self-censorship can also feel like a form of constraint. These works from the two series Hexen 2039 and Hexen 2.0 by artist Suzanne Treister show how the reality and fantasy of brainwashing have become entangled in the complicated web of twentieth-century history. The “Mind Control” diagram is a document from Treister’s alter-ego Rosalind Brodksy, who works for the Institute of Militronics and Advanced Time Interventionality. It brings together British military intelligence files with information from other sources, examining mind-control research and programs on both sides of the Iron Curtain. The tarot cards from Hexen 2.0 are part of a series of 78 “alchemical drawings” highlighting interconnected institutions and programs from the twentieth century and beyond. The cards chosen here highlight methods of mind control used in the West’s Cold War institutions, including the CIA’s MKUltra mind-control program; the psychedelic drug LSD; and the confluence of state and psychiatry at the Tavistock Institute. A COLD WAR CHILDHOOD In both East and West, the politics of Cold War competition crept into the playthings, heroes, and youth events that shaped childhoods. Military toys and dolls reflected the armed camps on either side; sporting competitions stood for partisan prestige; and spaceships, astronauts, and cosmonauts stretched youngsters’ imaginations about the future. The formation of adult identities and allegiances depended on ideas embedded in childhood play and activities. Beyond the domestic environment, being part of a youth movement such as the Young Pioneers could be a training ground for future political participation. “Cowboys and Indians” may look familiar to Western eyes, but in East Germany, Indianer playthings and films also carried an implicit criticism of the United States’ racism and occupation of Native American lands. Toy dolls allow children to imagine and anticipate future adult professions through play. The contrast between an American and a German soldier doll here is striking. In the wake of widespread nuclear armament, many simple toys were rebranded for the atomic age. Pistols became rayguns and pirate masks turned into space goggles. Douglas Malewickiâ&#x20AC;&#x2122;s Nuclear War card game satirizes the idea of the Cold War as a deadly strategic competition. Players can attack each other with both propaganda and weapons, but it is possible for the game to end with total destruction and no winners. In child psychotherapist Lynn Barnett’s short film, she talks to young people about their impressions of the precarious state of the world. The message she has for their parents is that we must take our fears seriously before we can resolve them. The space race between East and West inspired a new era of play in the 1960s. Playground designers adapted the forms of rocket ships, radar installations and other military vehicles into new kinds of play equipment. Some survived into the 21st century and became well-loved local icons such as “Rocket Ship” Park in Richardson, Texas. DISSENT AND ACTIVISM From the very start of the Cold War there was fierce opposition to the idea of permanent military deterrence. 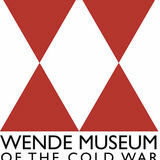 The first World Congress of Intellectuals in Defense of Peace was held in Poland in 1948, and the UKâ&#x20AC;&#x2122;s Campaign for Nuclear Disarmament was formed in 1957. The ramping up of Cold War tensions in the 1980s sparked a resurgence in the peace movement and prompted mass demonstrations for peace across Europe. Peace activists targeted civil defense preparations in particular, attempting to expose the folly of being prepared for a nuclear conflagration that would be essentially impossible to survive. While in the West, the peace movement drew on anti-establishment activism, in the East the countercultural peace movement typically appropriated state rhetoric for its own purposes. Global peace movements naturally called attention to the fragility of the planet, and the dangers to humans living on it. International Physicians for the Prevention of Nuclear War brought together medics from both sides of the Iron Curtain, and won the Nobel Peace Prize in 1985. In the UK, local authorities took responsibility for municipal civil defense, including distributing information to local residents. Some municipalities produced straightforward civil defense guides. Others were in the democratic control of left-wing parties, who used the opportunity to emphasize the dangers of preparing for nuclear war in a series of pamphlets that copied the format of civic defense material. Protest wasnâ&#x20AC;&#x2122;t always what it seemed. These multi-language signs attached to the American Embassy in Moscow took the form of anti-American protest elsewhere, in this case clearly with the official sanction and approval of the government. The resurgent peace movement of the 1980s focused some of its rhetoric on the horrors of nuclear destruction. Confronting the fear of an apocalypse could also mean refusing to be afraid of challenging the status quo. The radioactive symbol refers to the explosion in the Chernobyl Nuclear Power Plant in Soviet Ukraine, April 1986, which spread radioactive fumes over large parts of Europe and the Soviet Union. The Medical Campaign Against Nuclear Weapons was formed in 1980 and grew to a membership of around 3,000 from the professional medical community. MCANW campaigned across the UK, often counterposing the cost of weapons against the cost of healthcare. Their campaigning material emphasized the ineffectuality of being â&#x20AC;&#x153;prepared,â&#x20AC;? as medical providers, for the aftermath of nuclear war, and the moral imperative to ensure that it never happened. Joe-1 Cruising in Washington, D.C. In this series of prints from Yevgeniy Fiks’ project Homosexuality Is Stalin’s Atom Bomb to Destroy America (2012), a cutout image of the first Soviet nuclear-test explosion is posed at a number of known gay cruising sites (popular covert meeting spots) in Washington, D.C. The 1950s was a period of paranoia and persecution of suspected communists and homosexuals working for the U.S. government, and many politicians sought to explicitly link the two. Fiks explores, among other things, the irony that homosexuality was also criminalized in Stalin’s Soviet Union.